The first-of-class SSBN Yuri Dolgoruky is slated to undergo repairs at a Russian shipyard. The first-of-class Project 955 Borei-class (“North Wind”) aka Dolgoruky-class nuclear-powered ballistic missile submarine (SSBN) Yuri Dolgoruky is expected to undergo repairs at the Zvyozdochka shipyards in Severodvinsk in northern Russia, the head of the shipyards, Sergei Marichev, told TASS news agency on July 25. It will be the first larger overhaul of the lead SSBN of the Russian Navy’s new Borei-class. A start date for the repairs has not be set. “A day is not far away” when overhaul work on the boomer will begin, Marichev said. The Yuri Dolgoruky “was used quite intensively during its operation,” Marichev added. “When the Defense Ministry makes a decision to withdraw the ship for repairs, we will accept it.” The shipyard is currently in the process of obtaining the necessary documentation for officially accepting the boomer from the Russian Navy. The Yuri Dolgoruky last made headlines when it conducted the first successful salvo launch of four Bulava (RSM-56) submarine launched intercontinental-range ballistic missiles (SLBMs) from a submerged position in the White Sea off the northwest coast of Russia on May 22. The four SLBMs were launched in rapid succession within 20 seconds, and, according to the Russian Ministry of Defense struck their designated targets. The boomer can carry 12 to 16 Bulava (NATO reporting name SS-NX-30 or SS-N-32) SLBMs each armed with six to ten nuclear MIRV warheads yielding 100 to 150 kilotons each, as well as 10 to 40 decoys. The Yuri Dolgoruky last fired a Bulava SLBM from a submerged position in the Barents Sea off the northern coast of Russia in June 2017. The missile reportedly hits its target at the Kura Missile Test Range. Prior to that, the Yuri Dolgoruky launched two Bulava SLBMs from a underwater position in the White Sea in September 2016. The test was only partially a success with one missile successfully striking its target, while the second missile self-destructed shortly after takeoff. The 24,000-ton (submerged) Yuri Dolgoruky was laid down in 1996, launched in 2008, and commissioned into the Russian Navy in early 2013. The boomer completed its first nuclear deterrent patrol in 2015. 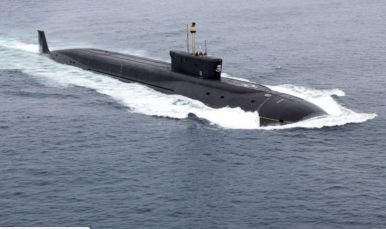 The Borei-class is the first new class of Russian SSBNs inducted into service with the Russian Navy since the end of the Soviet Union, although the boats are based on Soviet-era designs. The new sub class are to replace the single remaining Project 941 Typhoon-class boomer (currently used as a training ship and for weapons trials), as well as Soviet-era Project 667BDR Kal’mar (Squid) Delta-III and Project 667 BDRM Delta IV-class boomers. The Russian Navy currently operates three other Borei-class boomers. The Yuri Dolgoruky is in service with Russia’s Northern Fleet, while the other two SSBNs– Alexander Nevsky and Vladimir Monomakh — are deployed with the Russian Pacific Fleet. This marks the first time that a Borei-class boomer launched four Bulava ballistic missiles in rapid sucession.